Bacci Chocolates and San Valentino, Envy Italy Magazine and Spring Fashion in Beautiful Tuscany. Italy is said to be the land of romance. Having lived here for fifteen years, I can honestly say that if you want to find romance, Tuscany is as romantic as it gets. I have been inspired to write every day since I arrived here and I cannot help but write ‘Romantic’ thrillers. Yes, Italy has its dark side too, but that makes it all the more exciting. Along with the rest of the western world, we have just celebrated San Valentino, when the single men chase replacements for their Mamas and single women chase men for love and romance. Maybe that’s a little unfair, we do have a number of single men locally who are happy to stay at home with Mama and have the occasional dalliance. I hope you found your valentine last week! But back to romance; I have just read a lovely article in The Florentine Weekly all about the origins of ‘Bacci Chocolates’ in which it features this gorgeous painting called, yes you guessed it, ‘The Kiss’, by Francesco Hayez (1859). Bacio means kiss and I was really surprised to read that the chocolate was invented in 1922 by the founder of one of my favorite clothing designers, Luisa Spagnoli! You can either bite the top off for the hazelnut, or put the whole thing in you mouth and let it slowly melt and disintegrate leaving you to crunch on the nut later! Yummy. Gosh, how does one follow that? Well, if you are not already here, you are likely to be dreaming of Italy right now. A fabulous magazine that will have you drooling even more is Envy Italy Magazine, a gorgeous hard copy and on-line publication, which brings you everything that is luxurious about this beautiful country. Issue two features an interview with the fabulous Andrea Boccelli, and that’s just a taster. Well, back to my own daily living and simple things like enjoying morning coffee at La Dispensa in Fiano, reading the papers, greeting the locals and driving back through gorgeous vineyards and olive groves to my heavenly spot on the edge of the Chianti Hills. Oh, am I still at it, painting a glorious picture again. So sorry, just can’t seem to help it! Now, most of you know that my other love is Italian Fashion and I spotted this beautiful cardigan by Elena Miro worn by a happy smiley model, and just waiting to be ordered on-line. It has fringes, which I really like. I know, I’m indulging again, but a bit of shopping therapy does me the power of good. Where do you shop? Send me your recommendations. Well, enough of that, the sun is shining, there’s washing flapping in the wind, a pheasant calling and, if I were to start drinking again, a very nice glass of Chianti is in easy reach. But I’ll just dream about that for now. OK, time to get this blog edited and send off to you; am already a day late! Do have a great week and drop me a line, I love to hear from my readers. San Valentino, Elections, Sanremo-The Winner plus Sting and Carnivale in Beautiful Tuscany. OK, I have warned you about Italian Romeos in the past and this week girlies of all ages should take extra care. Anyway, from now up until the fourteenth, beware of Italian men offering you red roses. One rose is supposed to be very romantic, however, it might also indicate the size of his wallet! Ask immediately if he lives with his mother. If yes, then he’s probably after a bit of slap and tickle. If he gives you a sob story about his aging or ailing mother, he may be looking for a replacement! Either way, if he’s good-looking and invites you to dinner in a decent ristorante, why not! Enjoy! Foto La Nazione. Meanwhile, the papers continue to be full of the forthcoming elections. Villages and towns have had the big metal boards erected ready for the posters that go up shortly. Matteo Renzi, the former Prime Minister, seems to be talking himself into a big political hole, rather like David Cameron did in the UK. Both he and Silvio Berlusconi are now paying heed to the female political advisors, I’m glad to say, however, no sign of a likely candidate from their ranks for PM yet. Foto La Repubblica. 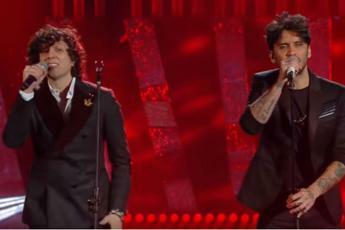 OK, so how did the Sanremo Music Festival end? I hear you ask. Well, the winning act was Meta and Moro. Meta was obviously doing a Doctor Who impression, aka Tom Baker! The guys nearly didn’t make it after they were suspended pending allegations of violations of the festival’s rules by the song presented by them. But all turned out rosy in the end. To watch the video and get an idea of how ‘high’ the standard of entries were, go to Youtube Video No comment. Would you believe, 12.2 million Italians watched the final on TV , the highest recorded since 2002! Foto Sanremo official website. Well, back here in our beautiful bit of Chianti, it is cold and raining. Contrary to popular belief outside of Italy, February can be chilly and wet. Despite that Crocuses are beginning to show their heads, the Mimosa and some Cherry trees are in full blossom and life is good. Local towns and villages are finally getting over the Carnivale Period and things are finally a little quieter; until the elections of course! Foto La Nazione. Soon, you will have more news about my books. I will shortly finish and publish my short story, The Man in Black, and am making big strides with the fourth book in the series ‘The Continuing Adventures of Joanna Wilde’ called ‘Assassins List.‘ So watch this space!